General. If you know the Philippines, with their tropical climate, then you would not immediately expect that there are places where pinetrees grow in the wild. Well, those places do exist high up in the Cordillera mountains of Luzon. Sagada is a small town located in a valley in the country's mountain province. The climate here is cool and ideal for the cultivation of fruit and vegetables that require more moderate temperatures. The main produce here is not bananas or mangoes but tomatoes, coffee, potatoes, strawberries, peaches, apples and so on. That all sounds yummie but that is defenitely not the main reason why Sagada is well known. No, the reason is a tradition that goes back many centuries that attrackts visitors: the way the indigenous people burry their dead. 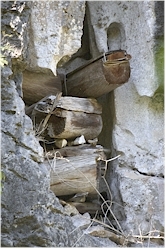 They either hung the coffins on the wall of a rock or put them in caves high in the mountains. How to get to Sagada. 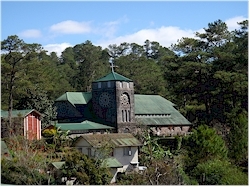 The most common way to Sagada is via Baguio. 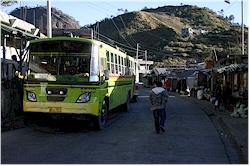 There you can take a bus that gets you to Sagada. However, the town is quite remote and you have to get through the high mountains to get there. The road is regularly prone to landslides and the maintenance is basic which make it one of the most dangerous roads in the country. But don't worry too much, the drivers are very experienced ;-). Depending on the condition of the road, the trip will take at least 5 hours. Alternatively, you can also go via Banaue. First you have to take a bus to Banaue and from there a jeepney to Sagada. It's a more complicated connection and it will also take you longer. Tours. There are several walking and trekking tours in the area. Check with the Tourist Office for the possibilities. If you go into the mountains or to the caves, registration and guides are obligatory.